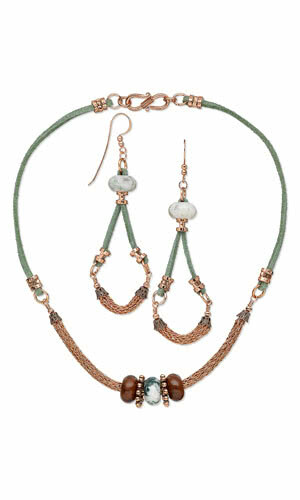 Following the directions in the Viking Knit set, using 20-feet of 26-gauge dead soft copper wire, weave a 5-inch section of wire tubing approximately 6mm in diameter. Open the loop on a 2-inch copper headpin. Anchor the headpin through the wire at one end of the Viking Knit tubing. String onto the headpin one bead cap to cover the end of the knit tubing and one 3mm corrugated round bead. Using a pair of chain-nose pliers, round-nose pliers and flush-cutters, finish the end of the wire with a wrapped loop. Gently bend the wrapped loop Viking Knit portion of the wire into a crescent shape. Repeat to create a wrapped loop to the opposite end of the knit wire. Using a pair of chain-nose pliers and flat-nose pliers, open an 8mm jumpring. Pass it through the wrapped loop on one side of the knit wire. Close the jumpring. Repeat to attach an 8mm jumpring to the opposite side of the knit wire. Repeat to attach an 8mm jumpring to each of the loops on the S-hook clasp. Using scissors, cut two 6-inch lengths of green suede cord. Pass one end of the cord through a crimp around the 8mm jumpring attached to the first loop on the clasp and back through the crimp. Place a small amount of glue on the inside of the crimp (optional). Using chain-nose pliers, compress the crimp onto the cord. Repeat to attach the opposite end of the cord to the 8mm jumpring attached to the Viking Knit wire. Repeat to attach the second suede cord to the opposite side of the clasp and Viking Knit wire. Following the directions in the Viking Knit set, using 20-feet of 26-gauge dead soft copper wire, weave a 1-1/4 inch section of wire tubing approximately 6mm in diameter. Open the loop on a 2-inch copper headpin. Anchor the headpin through the wire at one end of the Viking Knit tubing. String onto the headpin one bead cap to cover the end of the knit tubing and one 3mm corrugated round bead. Using a pair of chain-nose pliers, round-nose pliers and flush-cutters finish the end of the wire with a wrapped loop. Gently bend the wrapped loop Viking Knit portion of the wire into a crescent shape. Open a 5x5mm oval jumpring. Pass it through the loop on an earwire and an 8mm jumpring. Close the jumpring. Using scissors, cut one 3-inch length of green suede cord. Pass the cord through the 8mm jumpring attached to the earwire. Position the center of the cord on the jumpring. 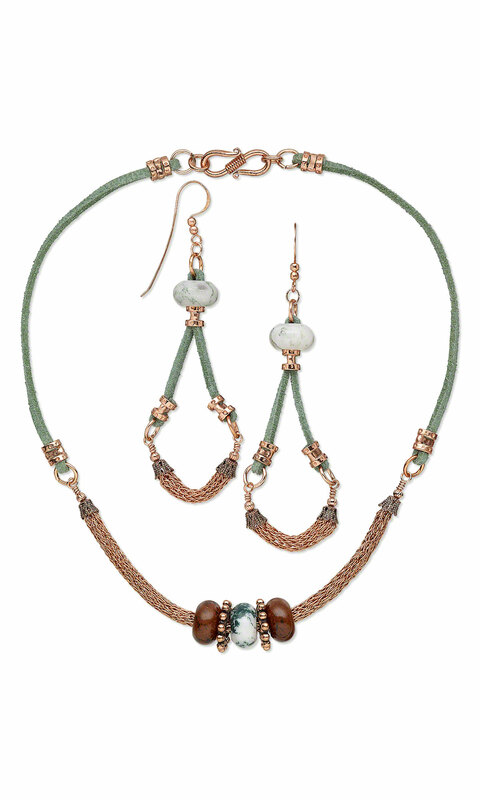 Bring the ends of the cord together and string onto both cords one 14x8mm rondelle tree agate bead and one crimp. Push the bead and crimp up next to the 8mm jumpring. Place a small amount of glue on the inside of the crimp (optional). Using chain-nose pliers, compress the crimp onto the cord. Pass one end of the cord through a crimp around the 8mm jumpring attached to the first loop on the Viking Knit wire and back through the crimp. Place a small amount of glue on the inside of the crimp. Using chain-nose pliers, compress the crimp onto the cord. Repeat to attach the opposite end of the cord to the 8mm jumpring attached to the opposite end of the Viking Knit wire. Repeat Steps 1 - 7 to create the second earring.